Look at that cover design! 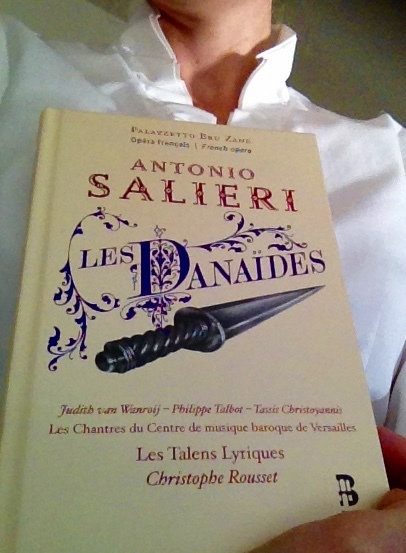 In some corner of my mind, Salieri will always be F. Murray Abraham. I can't help it. To be honest, this was one of the reasons that I jumped at the chance to review a gorgeously-produced recording of his sweeping 1784 opera, Les Danaïdes. Another reason was that it was simply and irresistibly beautiful (see left.) It has the kind of apparatus I can't resist, with critical essays in French and English, lucidly written and in a nice typeface. (I do realize that I'm revealing novel facets and depths of my nerdery, here...) With Les Talens Lyriques led by Christophe Rousset, the musical quality promised to be similarly luxurious, and I was not disappointed. There is an energy and brio to the entire performance that is irresistible. There's also orchestral creativity and moral nuance that I found fascinating. I'm not alone in this. Berlioz, seeing a performance in the 1820s, enthused about the éclat of the drama, the harmonic cooperation of chorus and orchestra, and the talent of the singers. Even without the benefit of dramatic tableaux, it's easy to echo his praise.